~ Cider Antiques ~: Vintage Buttons and Bling! I had some fun on the weekend going to a Jewelry sale. The auctioneer I know decided to try something different and have a tag sale instead. I found lots of goodies and the prices were great. I am a big fan of Marcasite and just love this floral bracelet. I lucked out! It is marked Sterling Germany on the back. 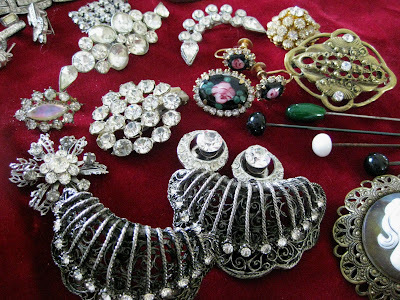 I also bought a few bag lots of brooches and pins. 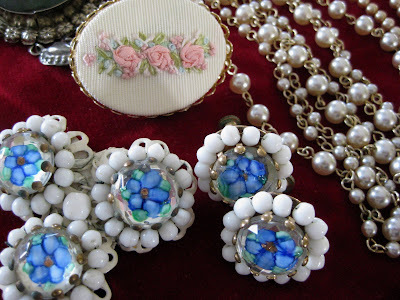 I love the black enamel brooch and earrings set with the pink roses. The hat pins and shoe clips are fun too ! 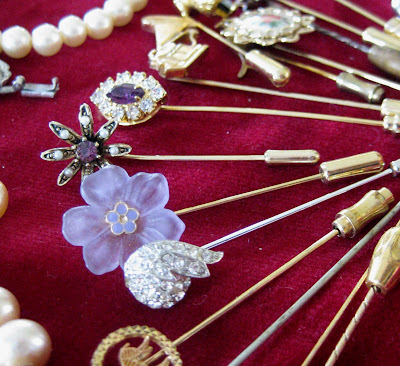 These little scarf pins were all bagged together in a lot of 25 pins. I bought the blue set "just because" the glass is so pretty. I also got a huge lot of buttons at an auction a few weekends ago. I was thrilled to find these Victorian Stag buttons . . . after sorting through the entire lot of +500 buttons I can happily say I have a set of ten deer buttons. I love cameos ~ real or fake. I bought these at the tag sale and was fortunate to discover that the bracelet is real! It has eight tiny shell cameos, not plastic. Once it was all cleaned up (and no longer solid grey from dust and dirt) I could see the beautiful detail in each hand carved cameo. It is always nice to have the odd surprise! FYI ~ I learned via google that you should oil your shell cameo twice a year to keep it from drying out. 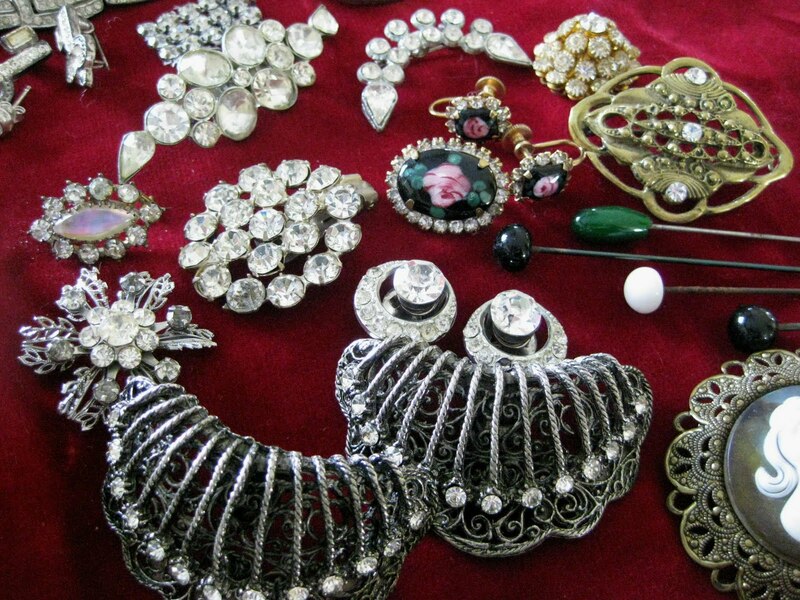 Oh what finds, just fabulous.....I love it all. Hope you get to do more of it. take care. Beautiful!!! I am in love with everything! oh my word Karen what scrumptious loot you have stumbled on. I'm drooling with envy, every piece is breathtaking love the buttons and the cameo bracelet is to die for. You win the prize for best finds!!!! 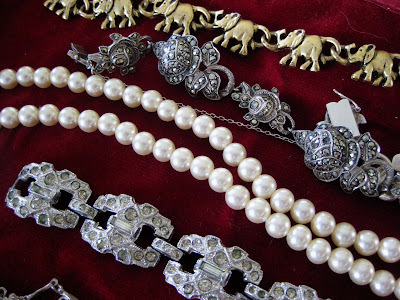 Love all your bling, especially all the vintage buttons, the cameos and the darling elephants. Everything is gorgeous. How lucky and I wished there was a wonderful auction like that here. Fantastic haul of jewels karen, well done. I would be soooo tempted to keep it all! Well, didn't you get lucky - some fabulous pieces there and you know I love cameos, too. Well done! How can I own all these lovely things? This is like travling back in time! Hi..found your blog via THE VICTORIAN PARLOR. 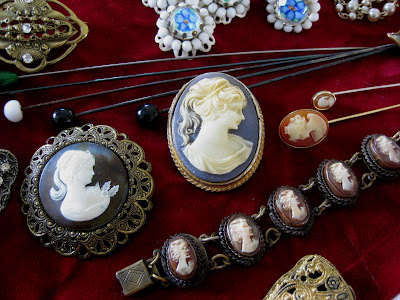 Joined your blog today..as I do not wnat to miss a thing..your buttons are wonderful..along with SO many other "treasures" here. 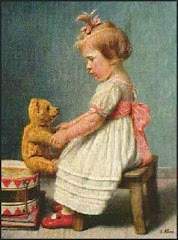 Have a good friend who is really into buttons, have passed your link to her as well.